PROVO, Utah (Dec. 9, 2016)—Even a Christmas tree has a story to tell. That’s what visitors learned while listening to a choir deep within the BYU Museum of Art. 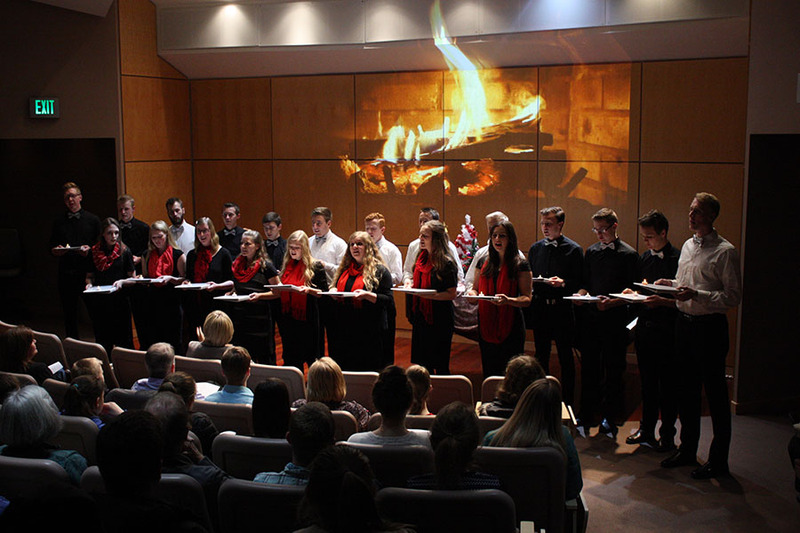 An annual event, the Scandinavian choir performance featured songs in various languages. This year, the choir sang “Santa Lucia” (Swedish), “Nu Er Det Jul Igen” (Danish), Tenn Ljus (Norwegian), En Etsi Valtaa, Loistoa (Finnish), “En Rose Så Jeg Skyde” (Danish), “Ó hve dýrðleg er að sjá” (Icelandic), and “Silent Night” (English). Together, the songs told the story of a Christmas tree, curious about the strange winter traditions of the nearby village and its part therein. Samuel covers events for the Department of Comparative Arts and Letters for the College of Humanities. He is a senior pursuing a degree in American studies with a minor in editing.